1 ball, 22 players, 90 minutes: Sounds like a great formula for fun. According to a Statista poll, 24 million Germans consider themselves to be football fans. And the Germans aren’t alone since soccer is considered to be the most popular sport in the world. Every weekend, fans around the world pack themselves into stadiums to cheer for their teams and enjoy spending time with other soccer fans. After you purchase the Plugin, it will automatically be available in your account. When you right-click, you will now see the option “Soccer” available. When you select, you will be able to fully customize the Plugin, so you see the content that is best for you. In addition to being able to select a country, you can also choose which games you would like featured from a list of both completed and upcoming games. As if that wasn’t enough you can change the color design and layout, so that your teams color are represented. Now any created content can be dragged into the playlist by using drag n’ drop. Of course, you don’t have to choose sides by adding several different leagues to the same playlist. 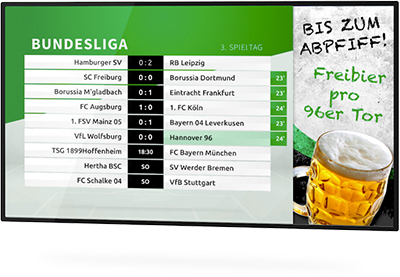 In fact, you can present all of the results and upcoming games for the big European clubs. In addition to creating a playlist, the Plugin also allows you to edit individual elements in a slide. Simply create a new slide and then add a “Media File” via “Objects”. The previously created soccer content can now be placed directly on a slide. This is a great way to combine the latest soccer information with additional information. The result is a great mix of information and entertainment. Your guests are excited to see the updated results and your advertising content gets a fresh new look. Want to display updates on both a tablet and a larger display, no worries. 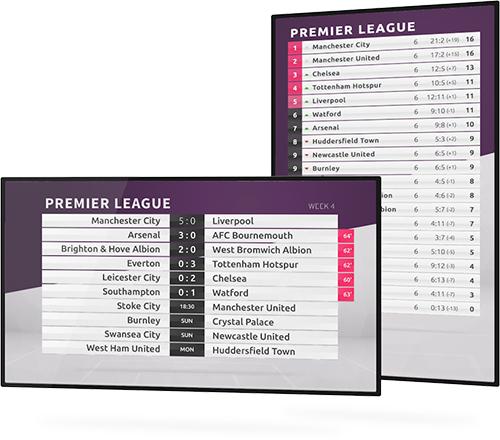 The Soccer Plugin can be displayed in both landscape and portrait modes. So show your team spirit and let everyone know who you will be cheering for this weekend. Carolyn is originally from the United States, but now lives and works in Germany. She tries to do a little bit of yoga everyday, at least one or two sun salutations. In addition, she likes to read and stay up to date on the latest in the worlds of marketing and economics. I cant buy the plug in !!! I can see it on the plug-ins and read all about it, but I cant buy it. I need it. Is it not released yet (21st FEB) ??? Im in Australia and wanted to offer this to the tourists, or aren’t we in Soccer season (sorry don’t follow it – Aussie rules fan) ? BTW – Viewneo systems are the best on the market, keep up the great work. Thanks for reaching out. We are planning on releasing the Plugin in mid-March. We are all really excited about the new Plugin and are working a couple of last minute improvements. I will keep you in the loop when it is released. But it looks like your Aussie rules season is about to start, so good luck. Stadiums signage is a smart move to play. Advertising with such displays can be worthwhile for the promotion purpose. You’re right stadium signage is a great way to promote your product and provide entertainment at the same time. viewneo helps your business by turning any screen into a stunning advertising sign – without any technical know-how needed. 1. “Kiosk mode” disables the ability to exit a playlist once it begins. The device owner must enter a unique key code to exit the playlist. This features was designed specifically to prevent in-store customers or non-device owner from pausing, exiting, or otherwise interrupting a playlist. 2 . The current viewneo Player App completes software updates in the background once available. Avoiding onscreen notifications and the need for users to manually confirm and complete software updates has been a very important product feature. We apologize for any inconvenience you may be currently experiencing. Our team is working as fast as possible to urgently produce an updated version of our Android app that complies with all of the new Google Play store developer policies. Please use the link below to access a manual installation of the viewneo Player App as well as instructions. Should you have additional questions, please feel free contact us at any time.